With all of the news around concussions, you might have thought that the head was the most commonly injured body part for NFL football players. 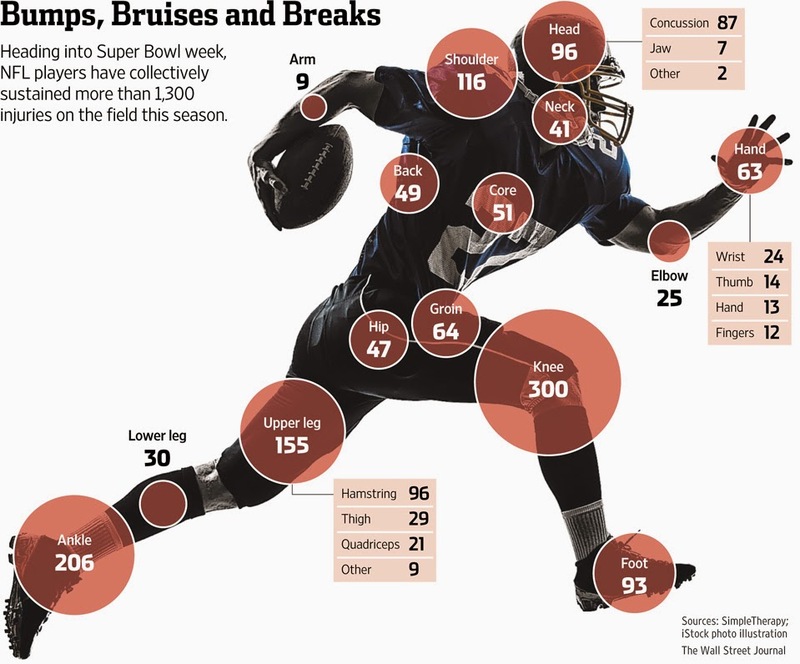 While it is injured a lot, last year football players suffered far more knee injuries than any other body part accounting for 22% of all 1,300 reported injuries. In all, lower-body injuries (ankle, knee, upper leg, foot, etc.) made up 63% of total injuries, while head injuries accounted for just 7%. The Wall Street Journal illustrated this in a cool infographic. We’re not surprised. The legs are part of all movements on the football field—running, blocking, jumping, bending, tackling, getting ready for a pass—so they are at risk every second a player is on the field. Not to mention, breaks, twists, tears and jams can easily happen when two bodies are colliding. While most of us are not headed to the NFL, we (or our children) may be playing during the year. Don’t get sidelined…check out the AAOS football injury prevention tips before gearing up.